Well damn... I was really hoping (view spoiler)[ Kasuga and Nakamura really would light themselves on fire (hide spoiler)] even though I know that'd never happen since there are 4 more volumes of the series. So now we're dragging another chick into this story... and Kasuga is still a nut case. And I still don't care about anyone. Sigh... yet I'll keep reading. Perhaps it's because this series is pretty short and the volumes are quick reads. So even though I'm not into this series, it's quick and easy to get through.Who knows... maybe something exciting will happen. Maybe I'll get a great ending like in Death Note. We'll see. The ever present flower, and visual embodiment of the series, closes its eye on the first stage. Years later, we find Kasuga has started a new life far away from his hometown, and those he knew. He is however left more empty than ever. Obediently, he tries to act "normal", but still struggles with his liminal self, and without Nakamura, is unable to decide who he is. Compared to previous volumes, his lack of expression is startling. For once he looks like everyone else rather than in various states of trepidation, but his eyes reflect his inner misery. This normalcy is furthered by a marked decrease in intensity with regards to both the art and topics. While the first stage brutally explored the uncomfortable aspects of the changes that occur in teens, at this turning point the author changes the tone to one that feels more contemplative. From now on, it is not only about discovering the changes in oneself, it is about coming to terms with them and walking forward. With the introduction of a new character who renews Kasuga's interest in books, finally there is some hope for him. I really thought this manga series was about to jump the shark after the previous two volumes but this one is a great new start. It's a few years later (five, one reviewer mentioned). Takao has longer hair and is quite the quiet, avoidant, cautious character these days. He's grown, he's less impulsive. Even his parents have changed in some ways. Then he meets a new girl, whom he has no interest in, until he realizes she reads even more dark literature than he ever did. She shares a part of her self platonically, her inner self, through these books they trade, that she hides from everyone else in her vapid social circle. She ... also has a boyfriend. You can see where this is going, but I love it. The maturity that the characters have at this point is notable, especially when compared to the young but appropriate foolishness of the previous volumes. I look forward to this new direction. The way this volume started, I was wondering if it was going to go in a completely different direction. Well, it did, but not in the way I thought it would. After the intense opening scene, we jump forward three years in a different town and different school. Kasuga's pretty much staying under the radar until he bumps into one of the popular girls in a bookstore and she helps him rediscover his love of books. It's not intense at all, but because of the first 6 volumes, there's an underlying dread over every scene. In Volume 7, we've reached one of the biggest climaxes in the series, and the watch its effects on life on the main character's life. 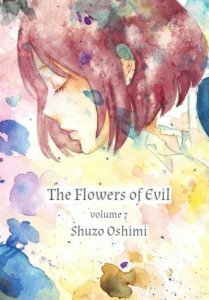 As always, the Flowers of Evil manages to maintain is absolutely stunning artwork and visuals, while keeping the story moving at a well pace. New characters are also added, and new problems seem to be arising. Also, the cover as a very nice feel to it, kinda like a hardcover while still being a paperback. If you've loved this series so far, don't give up now -- it only gets better from here. After reading the first six volumes I took a break from the series thinking it would drag along as middle schoolers.Volume 7 sums up the ending of volume six and picks up years later junior year of katsugas high school and the same feeling I felt after i read the first two volumes returned. Love this series. Conclusion to bad girl arc. Boy moves to new town\school and meets a nice girl who likes reading. Will she change the boy for the better? An insane story worth reading. Wow, this was a complete surprise. The way volume 6 ended, I thought this would be the climax of the series, but instead we get a jump forward three years and start a new arc. At first I thought it was just the denouement, but it kept introducing new elements instead of wrapping things up.In many ways, it's like a romance manga that's gone on so long that the author's run out of ideas and has to shake things up by breaking up the main couple and relocating one of them -- yes, I'm looking at you Kimi no Iru Machi -- except where that ploy always fails in romance, it works perfectly here. New location, new characters, but same ol' protagonist still unable to fit in. And you can already see the next train wreck coming. The failure of fitting and finding the other-way or the self-comfort, all this become part from the past now, Kasuga-kun left his home town and his past life to start again, but his past keeps showing in front of him, u cant run from past after all. the way that story progress amaze me every single chapter the way that "Shuzo Oshimi" handle the "Moving on" is pretty unique i must say. u actually can't forget or run from the past, u have to live with it, it will affect your present and future, all u have to do is ti live with it. and that what the answer will come in future chapters. This is absolutely the volume I'd be waiting for! I really wasn't sure with the last few volumes if I'd be able to continue enjoying the series. The beginning of this volume and the time jump sold me immediately. I actually wouldn't mind if none of the old characters ever came back at this point because I really enjoy the direction this series has taken. Stoked for the next volume! This series goes beyond words. Seriously. Dark and twisted and down right sick it has an underlying hope that cuts your heart into bits as you read. Definitely adult and definitely not for the faint of heart. Can't wait for volume 8! Best volume since 3, I think. Still best Manga in years. Arghhhhh I don't have the next volume!!??!? Part one of the latest 3 volume arc. See Volume 9 for review. Mejora tanto en argumento como en dibujo, algunas páginas son realmente hermosas. Quizás la mejoría de argumento también se debe a todo lo que tiene de peso debajo ya en este punto la historia. Could this be a better life for him? !